Any week that crams in Pancake Day, World Book Day, a work day in London and a mini rugby match in Bury St Edmunds (which I hasten to add involved my son not me) was always going to be busy. Here’s a selection of five frugal things we did along the way! Free biscuits? Don’t mind if I do. Normally, I don’t buy many biscuits. The general approach is that if someone wants to eat biscuits, they’ll have to make them – and we do enjoy baking family favourites like ginger biscuits, New Zealand biscuits and cookies with raisins or chocolate chips. However, last week I spotted that Shopmium, a supermarket cashback app, was offering some biscuits free, gratis and for nothing. I like Shopmium because it pays you back any cashback fast, and you don’t have to earn a minimum amount before you can claim it. 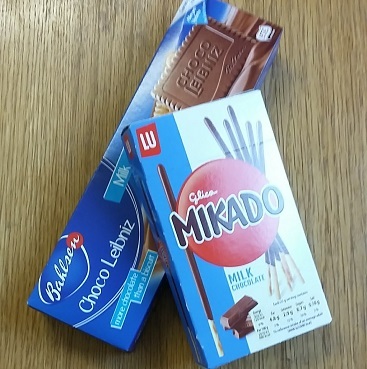 I duly added some Bahlsen Choco Leibniz and Mikado biscuits to the shopping list, sent in photos of the receipt using the Shopmium app on Saturday, and by Thursday the £2.60 was already back in my account. Super speedy! The biscuits made a delicious treat during the weekend, especially when we got back from taking the kids on a bike ride along the railway walk. If you’ve never used Shopmium before, it’s worth giving it a whirl to see if there are any freebies or discounts you’d like to try. Download the app (it’s on Google Play and the App Store) and enter the code KFKKAMKL and you can even claim a free bar of Lindt chocolate too! We didn’t quite manage pancakes on Shrove Tuesday, when my son disappeared off to Cubs and my daughter didn’t feel well. We make small fat pancakes on Sunday mornings, but for pancake day I went old style with big thin flat ones, accompanied by lashings of lemon and sugar. I even dug out a retro (by which I mean elderly) children’s cook book, to check on the proportions. The big surprise was spotting lard in the 1950s ingredient list. Maybe that’s because you can heat it much hotter than ordinary vegetable oil or butter? 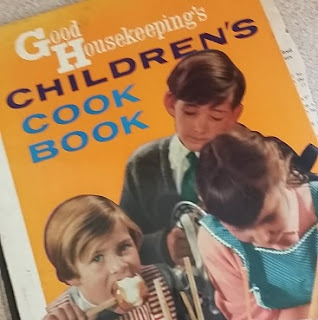 Funny how food fashions change – suspect there aren’t many references to coconut oil in the Good Housekeeping Children’s Cookbook, and I doubt my son would be delighted if I tried to make him wear a tie while cooking (or indeed at all). Anyway, I gave it a whirl, and the kids wolfed them down. Total: 31p, before you add toppings. Now, I do appreciate that buying these ingredients cost rather more at £3.84. For me, it’s worth shelling out the cash because I’ll use them all for other things. Even the lard gets used in pastry and for making Yorkshire puddings, and it lasts in the fridge for months. As an alternative, I saw the Co-op had small sachets of pancake batter mix for 25p, which only involved adding an egg and water. I can see that would make sense if money was really tight and you still wanted to make pancakes for your kids. 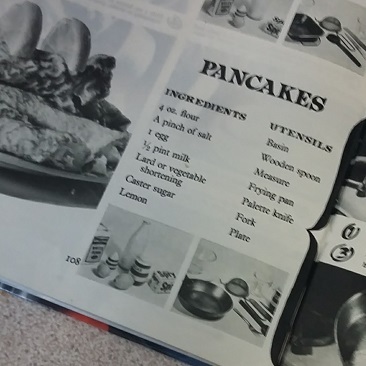 But loads of the other pancake mixes ask you to add eggs and milk – what do they contain? Paying £1 to £2 for a bag of measured flour seems a right rip off to me. Maybe there’s something I’m missing – do let me know in the comments! Your shield handle worries, sorted. Much as I love books, I do not love World Book Day. Apart from anything else, it seems to contribute far more to the sales of polyester fancy dress than anything to do with reading. I will save you the full auto rant on this occasion, but suffice to say my preferred Twitter hastag for World Book Day was actually #WorldofPain. This year, my son was determined to go as Tom from Beast Quest, mainly I suspect because it involved taking a sword into school. Good luck with that, teachers. Anyway in my frugal attempts to avoid buying an expensive costume, we made a family effort to cobble together a suitable shield. In true Blue Peter style, this involved much cardboard, parcel tape, felt tips, scissors, glue, searching on Google images, and only a small amount of swearing. 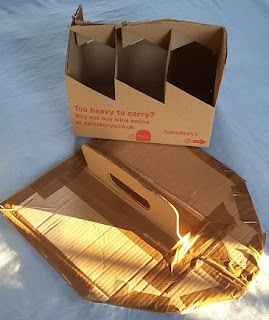 My top tip for future shield making was hacking apart a cardboard wine carrier to make a handle. Worked a treat. You can thank me later. I may not be the biggest fan of World Book Day, but I do love free books. I was therefore particularly grateful when a parcel arrived from Mumsnet Book Club. I’d entered a book giveaway competion for a copy of “The Painted Dragon“* by Katherine Woodfine. This time, it was a book for my daughter, rather than for me, and she’s already got stuck in. 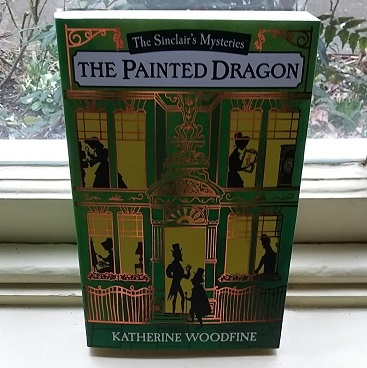 It’s a detective story for readers aged 9+, where the heroines, Sophie and Lil, face “forgery, trickery and deceit” on all sides in their search for a stolen painting. The quido pro quo is that we have to write a quick book review on Mumsnet, but there’s even a chance of winning a £100 Love2Shop voucher if we do. Appears piggy banks are old hat. Apps are where it’s at. Hark at me. A year ago, I didn’t even have a smartphone, and now here I am downloading a savings app. I’d like to do a proper post on Chip, but it’s meant to help you save money by studying your current account, and then siphoning off cash it reckons you can afford into a savings account with Barclays. You are notified of any potential transfers, and can stop them if you want. The part that made me think “kerching” was that you can earn up to 5% interest by inviting your nearest and dearest to download the app too. Given how rubbish most savings rates are right now, that’s pretty good. Chip also lets you shovel across up to £100 a day yourself, which means that potentially you could end up with a bigger balance earning 5% than using one of the high interest current accounts. In exchange you do have to bear with the gifs and bad puns, but every little helps in making the most of your money! Now over to you – any frugal successes to celebrate? Do share in the comments, as I’d love to hear. I’m linking up with this Cass, Emma and Becky in this week’s ‘Five Fabulously Frugal things I’ve done this week’ linky. Disclaimer: no-one has sponsored me to write this post (sob), it’s just me banging on about some of the things I do to stretch our family budget. If you’re kind enough to use the referral codes, then I’ll get a few pounds, and you’ll get chocolate, interest or cash, but you can also download the apps without using any codes at all. Loving your frugal week and creativeness with the wine carrier:-) I keep getting the notifications from Shopmium but then forgetting to check when I am irregularly at Tesco…because free stuff is the best! Thanks Lynn! Worth keeping an eye on apps like Shopmium, even if they don't always have products or discounts you'd like to try. The best frugal thing I did this week was go around a lovely Antiques Centre and NOT BUY ANYTHING! I saw children all dressed up when they came out of various school yesterday (we were driving home at the time and passed several schools in the Bay) Some looked to be in home-made costumes (a boy in black trousers and black T-shirt – no idea who he was supposed to be!) and little girls in what looked like Alice in Wonderland dresses. Let's hope they actually read some books on World Book Day. Sounds like amazing will power at the Antiques Centre. My children both enjoyed World Book Day, and did get extra time for reading. It's just me being grumpy about yet another fancy dress burden for parents. Got to love the Tiger Who Came to Tea. We got a tiger costume for my daughter when she was tiny, and it proved very useful for World Book Day at nursery age! Hope you and your nieces have a fabulous time with the new books. We did tintin costume with our single smart school shirt, dad's jumper, sports socks and younger brother's trousers – cost: zip all! Cost: zip all? My favourite kind of fancy dress costume. I hadn't spotted those biscuits on Shopmium yet – I really must visit more. Thanks! They were both great. You can get money off additional packs of the Choco Leibniz too. I really need to check my Shopmium app more, I downloaded it ages ago and have opened it once – oops!